Super-fast multi-core engine. Every year, electronic circuits become faster and more complex, and therefore require more and more computational power to analyze their operation. To meet this requirement TINA v9 has the ability to utilize the increasingly popular scalable multi-thread CPUs. Computers that incorporate dual or quad core CPUs can deliver up to 20-times faster execution time for TINA’s analysis engine compared to previous versions and main competitors. Open from the Web! Now you can open TINA designs, models and libraries as well as Import Spice .CIR and .LIB files directly from the Web. See TINA Circuits on Web page where you will find interesting electronic circuit files and links to other websites with circuits and libraries which you can open directly from the web and then simulate with TINA. Easy to use schematic entry. Enter any circuit within minutes with TINA’s easy-to-use schematic editor. Enhance your schematics by adding text and graphics elements such lines, arcs arrows, frames around the schematics and title blocks. Choose components from the large library containing more than 20,000 manufacturer models. You can check schematics for errors with TINA’s advanced ERC functions. The schematic editor supports complex hierarchical designs, team design and version control. Powerful analysis tools. Analyze your circuit through more than 20 different analysis modes or with 10 high tech virtual instruments. Present your results in TINA’s sophisticated diagram windows, on virtual instruments, or in the live interactive mode where you can even edit your circuit during operation, develop, run, debug and test VHDL & MCU applications. 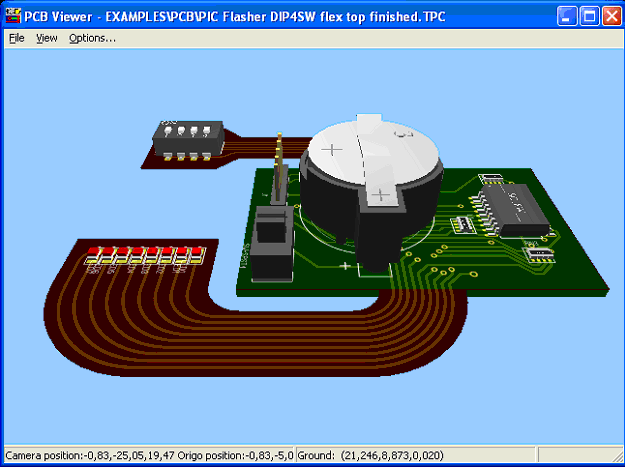 Integrated PCB design. The new fully integrated layout module of TINA has all the features you need for advanced PCB design, including multilayer PCB’s with split power plane layers, powerful autoplacement & autorouting, rip-up and reroute, manual and ”follow-me” trace placement, DRC, forward and back annotation, pin and gate swapping, keep-in and keep-out areas, copper pour, thermal relief, fanout, 3D view of your PCB design from any angle, Gerber file output and much more. Advanced presentation tools. Make stand-out reports and presentations of schematic diagrams, annotations, formulas provided by symbolic analysis, Bode plots, Nyquist diagrams, poles and zeros, transient responses, digital waveforms, and other data using linear or logarithmic scales. Customize presentations using TINA’s advanced drawing tools to control text, fonts, axes, line width, color and layout. You can create, edit and print documents directly inside TINA or cut & paste your results into your favorite word processing or DTP package. Importing Spice models. Create new TINA components from any Spice subcircuit, whether created by yourself, downloaded from the Internet, obtained from a manufacturer’s CD or from portions of schematics turned into subcircuits. TINA automatically represents these subcircuits as a rectangular block, but you can create any shape you like with TINA’s Schematic Symbol Editor. You can also use TINA’s parameter extractor program to calculate model parameters from catalog or measurement data and then add the new devices into the catalog. Educational tools. Educational tools. TINA also includes unique tools for testing students’ knowledge, monitoring progress and introducing troubleshooting techniques. With optional hardware it can be used to test real circuits for comparison with the results obtained from simulation. With the Live 3D breadboard tool you can automatically build a life-like 3D picture of a solderless breadboard. When you run TINA in interactive mode, components like switches, LEDs, instruments, etc. become “live” and will work on the virtual breadboard just as in reality. You can use this capability of TINA to prepare and document lab experiments. You can also use the integrated Flowchart Editor and Debugger to generate and debug the MCU code, learning and teaching microcontroller programming. Real time measurements. TINA is far more than a circuit simulator with virtual measurements. You can install optional, supplementary hardware that allows real-time measurements controlled by TINA’s on screen virtual instruments.